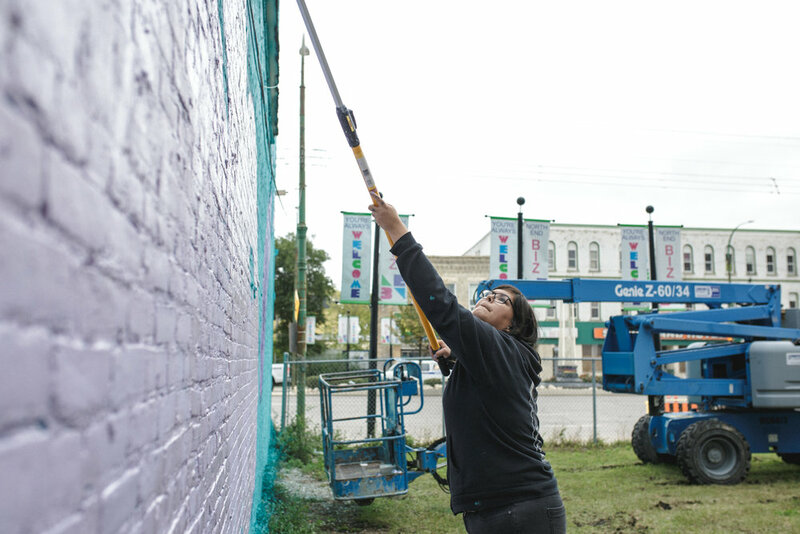 A handful of massive murals went up around Winnipeg's core last week as part of the Wall-to-Wall Mural & Culture Festival thrown by Synonym Art Consultation. More specifically, along the north side of the New West Hotel and across a grassy vacant lot on the south side of the Medi-care Pharmacy on Main Street, four technicolour animals now stare each other in the eyes. The piece is the work of artists Jessica Canard, Siyee Man, Joseph Pilapil, Pat Lazo, and Gabrielle Funk, and draws its inspiration form the four weeks they spent teaching street art to the young people of Studio 393, a youth-led arts studio for emerging artists by Graffiti Art Programming Inc. The street-art workshops were balanced by activism workshops, where the teens “had discussions on the issues they were passionate about. We were just teaching them style; the content of the art they made was based on what they wanted to do. From that, we got the idea for the need to be unified together and to live positively,” says Siyee. Last Friday, I had the chance to sit down with Gabrielle, Siyee, and Pat to chat more about their work on the mural. They’ve been putting in long, hard days, with different artists coming in at different hours. I catch them on a quick break before they have to head off to grab the lunch provided to artists and volunteers. FULL: How has the concept for the mural evolved since your early meetings back in August? Pat Lazo: We met a few times, and at first I thought it was pretty challenging, because we all have different practices. But we came to the consensus that we wanted to talk about the experiences of the youth in our workshops. Siyee Man: The plan did evolve quite a bit from the beginning though. We were planning on doing one animal on each wall. Then Gaby drew a wicked sketch of the bear and the dear looking at each other. PL: It was cool how the different species of animals and the choice of the wording came together. We were spit-balling ideas back and forth. The discussion evolved, and each of us spitting stuff out made it come together. SM: We also considered how big of an impact we could achieve from just the passing traffic. There’s quite a large gap between the murals, but it’s still a narrow passage, so your line of sight when you’re driving in either direction is limited. We wanted something simple that got the message across, and it took us a little bit to get there. We talked about a lot of different words. PL: We also considered the experience of the wall going south or going north. We wanted the walls to stand alone, but make sense together. Sitting in the middle of the two, I think they do. FULL: I’m curious about your choice to use animals as a metaphor for the community instead of going for a more literal interpretation. SM: We all use animal content in our art. It was a simple thing we all have in common. GF: Also, animals are a more accessible way to represent the idea. Instead of doing one person and limiting it to one type, an animal can be a wider symbol. PL: I think you can relate to it from any culture. Many cultures use animal references as part of spirituality. GF: We did talk a lot about the animals. Especially with the snake and the symbolism that could be gleaned from that. All the animals on the walls are pretty powerful symbols cross-culturally. FULL: Earlier, Pat mentioned that you all have different practices. How were you able to integrate that, and how has this been different from or similar to the work you’ve done before? GF: I would say that my practice changes. As of late, it’s been a lot more community-oriented and programming-oriented. I’ve definitely done more solo, small-scale work by far than murals or working collaboratively. But my comfort zone is in a collaborative space more than working alone. It gives me energy and gets me excited. I’ve never had the experience of starting from scratch working with this many people to bring ideas together and create a complete project. It’s definitely been a huge learning experience. SM: I have a lot of different practices. I enjoy using spray paint and house paint mostly on canvas. 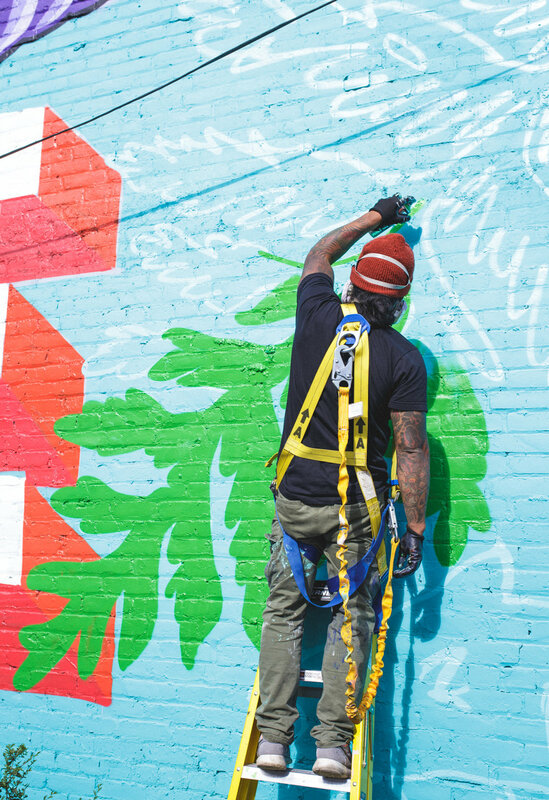 I’ve worked on a few murals in the city with Andy Bergen. I really like graphic images, so I usually stick to solid colours, stencilling. PL: I work as artistic director with Graffiti Art Programming, so I work with a lot of artists and do a lot of the leg work for setting up art exhibits and murals inside the gallery. I’ve done some murals in the past. Last year I helped lay the background for “The Mending Wall.” The artists were here for a limited time and were also doing a show at Graffiti. I’ve helped with a lot of murals and done smaller pieces, but this is the biggest piece I’ve done. FULL: Gaby mentioned that the process has been a huge learning experience for her. What are some things you’ve learned from working together on a project of this scale? What challenges have you faced? SM: I found it pretty tough in the beginning: trying to get the feel of what everyone would like to do, how everyone would like to get their style thrown on to this collaborative piece. At the beginning, we determined that it wasn’t going to be a jam wall, where we each do something of our own, we wanted it to be one cohesive image. So to figure out how to draw everyone’s personal elements in and work them into one piece was pretty challenging. GF: I would say that our flow wasn’t very natural from the beginning. It took us a little bit to get going. Ideally, in a collaborative scenario, everyone has a strength that’s recognized, and everyone has a role. It’s challenging to try and keep everyone on the same level as far as creative contribution, but also just putting in the work, covering the walls, the elbow grease. Those are all important elements. And trying to make sure that everyone’s represented, being aware of where everyone’s at, and communicating: all of those things are really complicated. That takes time. There’s a natural frustration that can come out of that, but also a lot of inspiration. I feel like we’ve hit our stride now. Once we started painting and seeing the walls develop, we all felt really inspired. We learned how to communicate with each other and trust each other. PL: I work a lot collaboratively. I know it can be challenging, but there’s always a lot to take away from watching somebody paint. Someone doesn’t necessarily have to show you exactly how they’re doing it, you can watch and absorb their energy. I find that really cool. I can sit and watch how they go about doing something, and I can take that with me as another tool in my toolbox. It can make me more efficient later on. To see the murals for yourself, use Synonym's mural map, complete with the images and location of each mural.